We’ve just put the finishing touches on a brand new, totally “responsive” website which uses our new API. Stage One of SearchLocally.com.au has now been launched! It features an extremely efficient search and category browse options which access the database from our main Come On Aussie site. Using our new API, SearchLocally.com.au provides a different perspective for your local web search needs. It provides users with quick and easy access to local Australian web-search results, without overwhelming them with data they don’t need to see! The next stage focusses on the ongoing development of useful information on websites in regional and country areas of Australia. And these are areas which have been overlooked by the major players in the market! We’re trying to encourage Australians to search for their “local” Aussie business websites. And that means providing you with various alternatives to help you “discover” local Australian websites you didn’t know about. Websites which allow you, in particular, to find out even more about your LOCAL area and the businesses there! So that you can, in turn, give the local guy a chance to get your business, because a thriving local economy is good for everyone in that community. 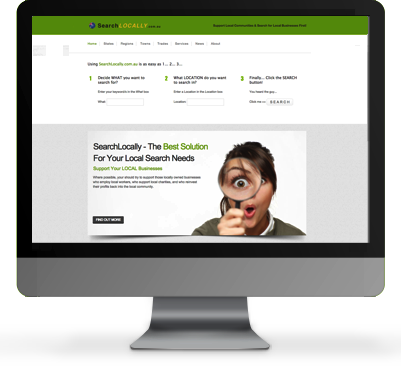 If you have an Australian local business website and want your details to appear @ SearchLocally… then submit your business listing here! “Technically” the API uses JSON feeds to extract the business data from Come On Aussie… and will shortly be in place on other sites across our network! The Come On Aussie API is also now available to other developers who might like to use our Aussie data! Get more details on what is required here. 21 Years OnLine? Who Woulda Thought? Shattering the Windows to Your Digital World!